An international team of scientists involved in the SDSS-IV MaNGA (Sloan Digital Sky Survey-IV Mapping Nearby Galaxies at Apache Point Observatory) project is studying approximately 10,000 galaxies near Earth. The researchers are trying to build maps that can provide details of individual galaxies in order to understand their life cycles, from birth, growth via star formation and eventually death. "The critical power of MaNGA is the ability to observe thousands of galaxies in three dimensions by mapping not only how they appear on the sky, but also how their stars and gases move inside them," says Kevin Bundy, MaNGA's principal investigator at the Kavli Institute for the Physics and Mathematics of the Universe. Using data on the electromagnetic radiation emitted by galaxies, the team narrowed in on a question that has confounded astronomers for years. A large fraction of galaxies in our nearby universe appear dead and red in colour because they are devoid of fresh young stars. What is not known is how these systems remain inactive, given they have the ingredients needed to form stars. It is extremely cold inside 'molecular clouds'—dense concentrations of gas and dust—causing atoms to bind together. The deep cold also causes gas to clump to high densities. When the density reaches a certain point, stars form. Theoretically, once star formation in these galaxies has been shut down, something must be removing or heating the gas that is forming under the influence of gravity. "Stars are created by the cooling and collapse of gas, but in these galaxies there are no new stars despite an abundance of gas. It's like we have rain clouds hanging over a desert, but none of the rainwater is reaching the ground," explains Edmond Cheung, lead author of the study. Cheung's team is developing galaxy maps that provide a clue as to why stars aren't forming. These measure star velocity (the rate at which stars change in position), average star age, star formation history and details about gasses and the elements contained within them. While doing so, two particular galaxies caught the team's attention. The first, nicknamed Akira, was similar to a group of galaxies in its red colour and lack of young blue stars. 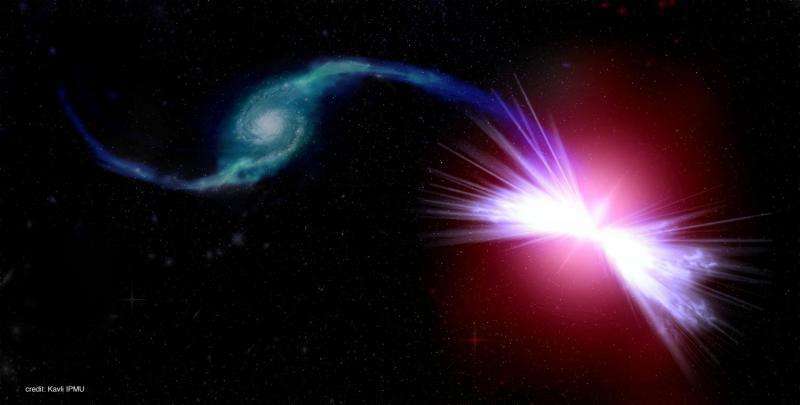 It also exhibited prominent wind outbursts caused by a supermassive black hole, giving the appearance of geyser outbursts. Akira was shown to be full of complex patterns of warm gasses, which implied an outflowing wind from the supermassive black hole at its centre. The team used the term 'red geysers' to describe this new class of galaxies. The next question was: where did this 'fuel' for the supermassive black hole come from? Based on advanced computational calculations, they hypothesized that a nearby interaction with a smaller galaxy, nicknamed Tetsuo, was responsible. This smaller neighbour provided Akira, through shocks and turbulence, with the fuel supply needed to heat its surrounding gas, ultimately preventing future star formation, which requires gas to be cooled. So far the MaNGA project has compiled data from about 3,000 galaxies. This is a significant addition to the existing 800 data sets in the public domain as of April 2016 and will allow researchers to compare star formation and death events across galaxies.